The Champlain Canal goes from Waterford, NY to Whitehall, NY, connecting the Hudson River with Lake Champlain. The canal, as well as its entrance on the Hudson River and its exit on Lake Champlain, passes many sites that are part of A Revolutionary Day on US Route 4, US Route 7, and US Route 9. Many of these sites can also be visited by water from the Hudson River, the canal and Lake Champlain. During the time of the war, Lake Champlain and the Hudson River were major transportation routes. If the British could control these routes, it would cut communication and the flow of supplies between New England and the rest of the colonies. It would also eliminate a very navigable passage as an American transportation route. At the same time for the British, it would open a major supply route from New Britain (Canada) to New York City, which were both held by the British for most of war. In the spring of 1777, British General Burgoyne devised a three-pronged invasion to divide the colonies along the Champlain and Hudson valleys. The invasion would come from Canada in the north, New York City in the south and Lake Ontario in the west. The target for all three was Albany, NY. All three invasions failed. Burgoyne led the largest of the British forces from Canada and eventually surrendered at Saratoga. The force from Lake Ontario withdrew at Fort Stanwix and the force from New York withdrew after setting fire to Kingston, NY. Today, the Champlain Canal not only parallels Burgoyne’s 1777 route, but also passes near a wealth of Revolutionary War sites that cover the entire period of the war from 1775 to 1783. DAY 1: A Revolutionary Week Along the Historic Champlain Canal begins early in the morning on the Hudson River opposite the town of Bethlehem, NY, just south of Albany. From Bethlehem, you will sail past many areas where 18th century patriots once lived. When you arrive in Albany, you will dock at the Corning Preserve and take a short walking tour of Albany’s historic sites, including the Quackenbush house, where Burgoyne was a prisoner/guest after his failed invasion. From Albany, you will continue sailing north through the Federal Lock in Troy and Locks 1 and 2 on the Champlain Canal to Mechanicville where you will dock for the evening. DAY 2: Continue sailing north through Locks 3 and 4 and anchor offshore near the Saratoga Battlefield where you will take a short walking tour of the Great Redoubt. From the battlefield, you will continue sailing north through Locks 5 and 6 to Fort Edward where you will dock for the evening and visit the old fort’s historical sites. Burgoyne headquartered at Fort Edward during his invasion. DAY 3: Continue sailing north through Locks 7, 8, 9 and 11 (Lock 10 was never constructed) to Whitehall where you will dock for a visit to the Skenesborough Museum. From the museum, you will continue sailing north through Lock 12 to a marina near Mount Independence where you will dock for the evening and make arrangements to visit Mount Independence. The fort at Mount Independence was evacuated and destroyed by the Americans when Burgoyne set cannon on top of Mount Defiance, opposite the fort. DAY 4: Continue sailing north on Lake Champlain and anchor near Fort Crown Point where you will take a walking tour of the old ruins. Fort Crown Point and nearby Fort Ticonderoga were captured from the British in 1775. Americans under the command of Henry Knox moved cannons and munitions from the forts to force the British from Boston in 1776. From Fort Crown Point, you will continue sailing north to the Lake Champlain Maritime Museum. After a visit to the museum, you will sail across Lake Champlain and dock at Westport for the evening. DAY 5: Reverse direction and sail south and anchor near Fort Ticonderoga for a visit to the restored fort. Because of its commanding presence over the southern part of Lake Champlain, the fort has been called “a Key to a Continent.” After touring the fort, you will continue sailing south and dock at a marina in Whitehall for the evening and visit historical sites at the home of the US Navy. DAY 6: Continue sailing south through Locks 12 and 11 and dock at Fort Ann where you will visit the historic town. 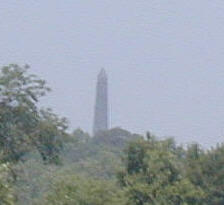 Fort Ann was the source of significant resistance to Burgoyne’s invasion in 1777. After a walk around town, you will continue sailing south through Locks 9, 8, 7, 6 and 5 and dock at a marina in Schuylerville for the evening. While in Schuylerville, you will take a walking tour of the town where Burgoyne officially surrendered his army to the Americans. DAY 7: Continue sailing south through Lock 4 and dock for a visit to Stillwater. Stillwater was a headquarters for the Northern Department of the Continental Army. 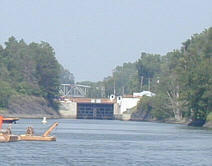 After a walk around town, you will continue sailing south through Locks 3, 2 and 1 to Waterford. Dock in Waterford and conclude your Revolutionary Week Along the Historic Champlain Canal with a visit to this historic gateway to the Champlain and Erie Canals. 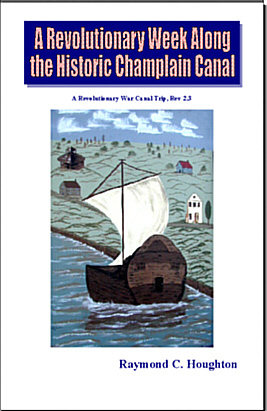 Tell us about your revolutionary week along the Champlain Canal. Copyright © 2003 by Cyber Haus. All rights reserved.